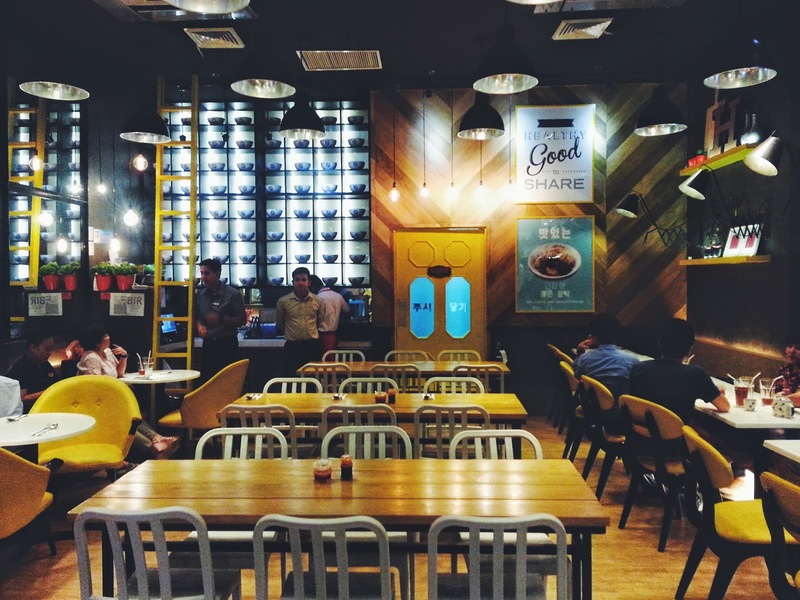 Upon receiving an e-mail invite last week to Chef's Noodle Robinsons Magnolia branch's ribbon-cutting ceremony, I immediately responded with a yes. 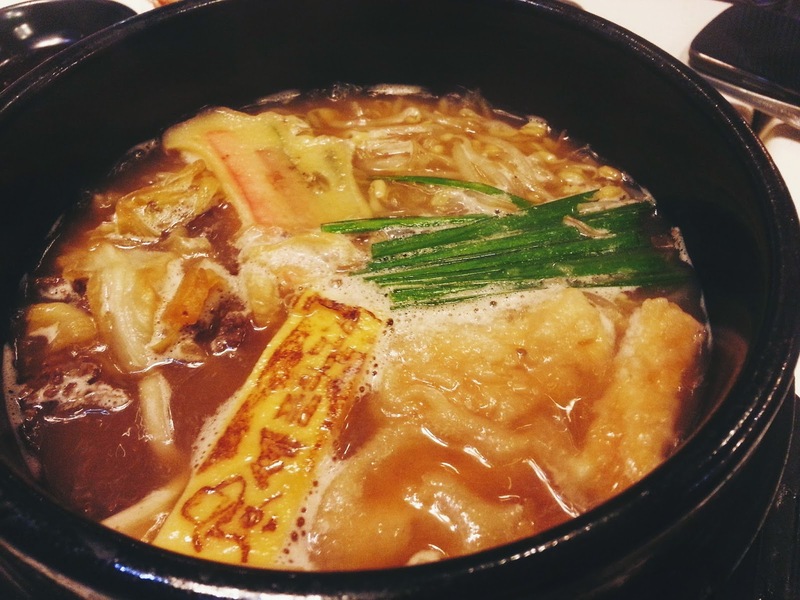 I love Korean food! Before, the first (and maybe only) thing that comes to mind when someone says Korean food is kimchi, but after working at Samsung for a while, I got exposed to dining at some authentic Korean spots which made me fall in love with the hearty, most of the times spicy cuisine. 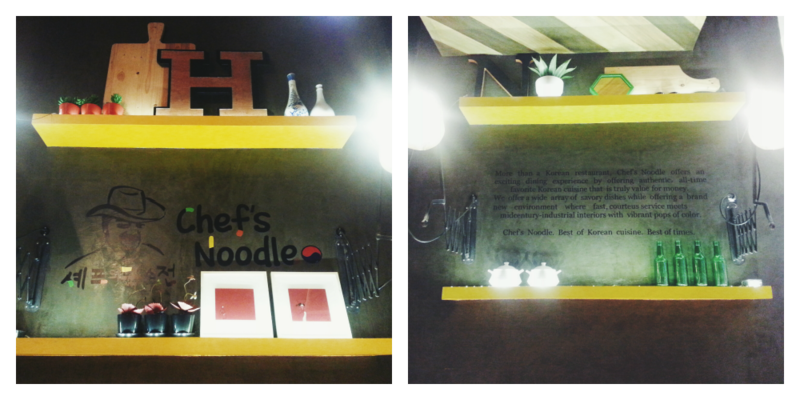 What I found interesting about Chef's Noodle (after Google-ing) was that it appeared like a casual, fancy Korean restaurant. 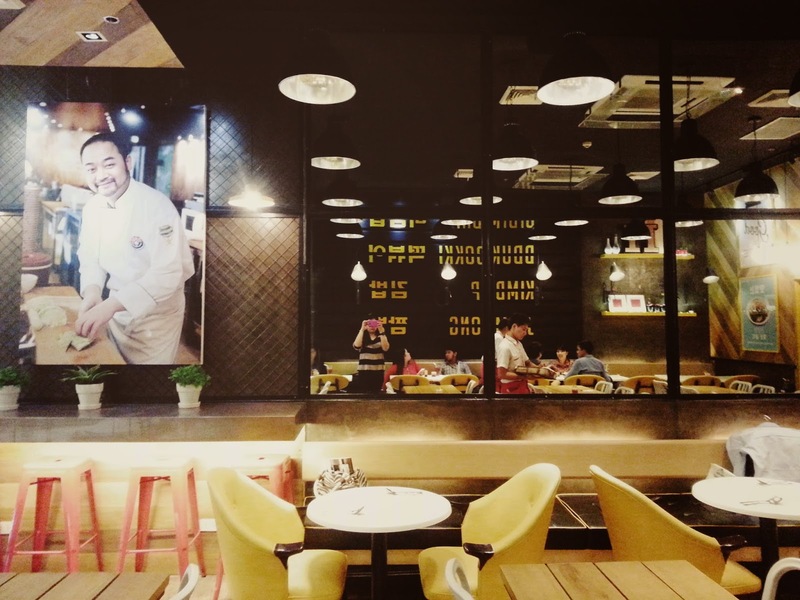 I've been to a couple of authentic Korean restaurants (apart from Bon Chon and Bulgogi Brothers) and I've never seen one that's looking so modern. Now, I'm really excited to try what they've got to offer. It was my first time visiting Robinsons Magnolia (good thing it was a short trip from the office), and luckily found Chef's Noodle right away. I'm totally smitten with the restaurant's interiors. I loved the yellow and black palette along with the wooden pieces of furniture. Also, I liked the fact that they didn't put paint on the right wall, which had these shelves that held some knick-knacks. It gave off a very modern, luxurious but laid back feeling. I thought it could even pass as a cafe because it somehow reminded me of Subspace. Whoever is responsible for designing the place deserves a gold medal. Hahaha. 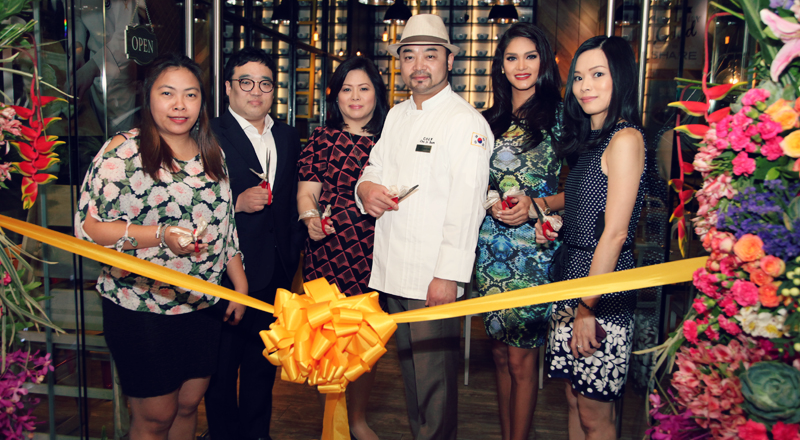 The ribbon-cutting ceremony was graced with the presence of Chef's Noodle Korea owner, Kim Suk Hoon; Korean celebrity chef, Choi In Sun; Chef’s Noodle Philippines CEO, Mary Simisim; Operations Manager, Nancy Go; and celebrity guest, Pia Wurtzbach. For those who don't know (like me haha), Chef Choi In Sun is famous in Korea for his cooking show, Starking Show. If you ask me, he should also be famous for effortlessly rocking that Fedora hat! Haha. 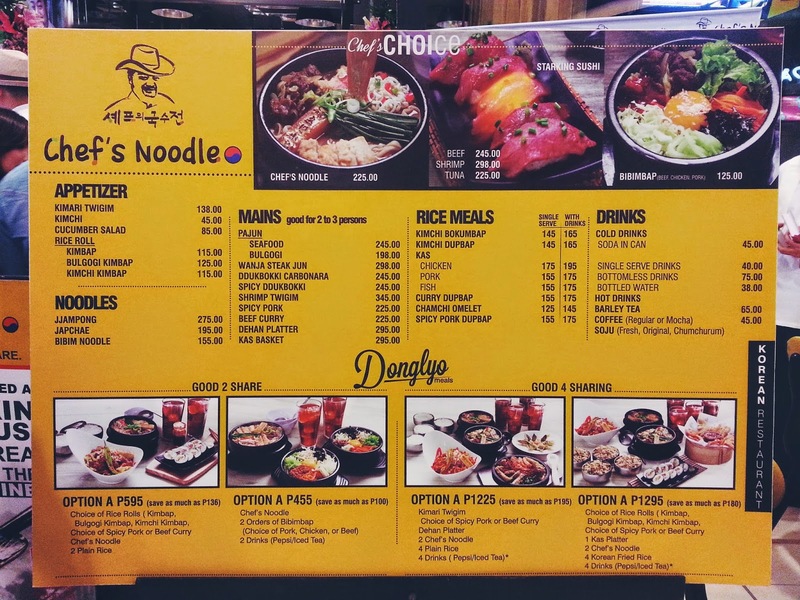 Also, Chef's Noodle is one of Korea's most celebrated restaurants. If they're that good, it's a great thing they're already here! Fortunately, the other bloggers I'm sharing the table with wanted to try as much dishes as we can (not our fault, they told us we could order anything from the menu hehe), so we ordered a w h o l e l o t.
Now this is an interesting dish. Very east meets west. What looks like penne were actually cylindrical rice cakes. 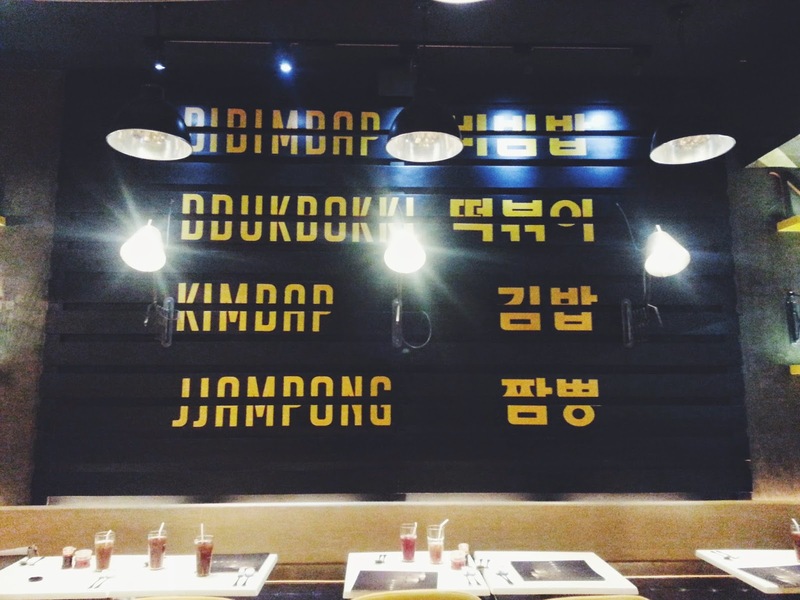 And from what I've read from the Internet, ddukbokki is usually served with spicy sauce. I love that they're being innovative. I actually liked this one. 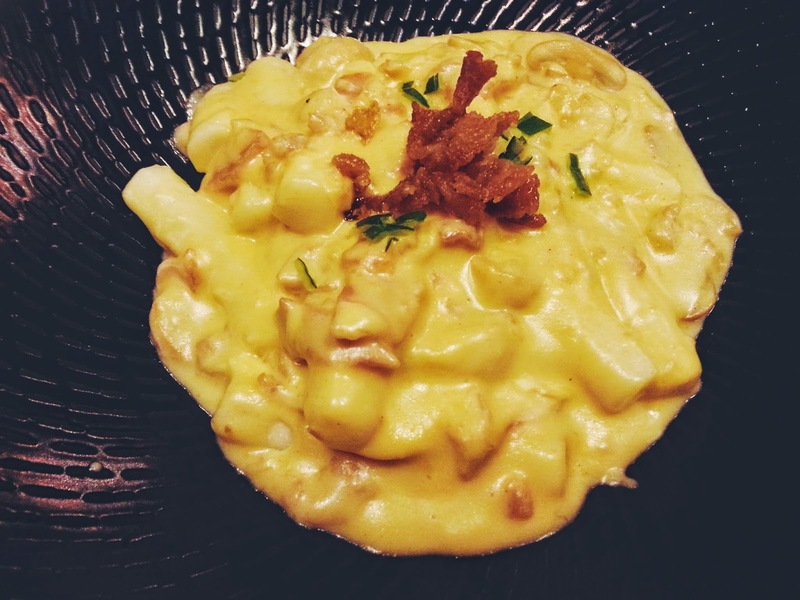 Although it kind of takes some getting used to because the rice cake was very chewy, but since I'm all for pasta/anything with white sauce, I appreciated the twist in this meal! It's a few pieces of whole shrimp coated in light batter and fried, and served with onion rings. Twigim actually translates to "deep fry." Nothing to get hyped about this. 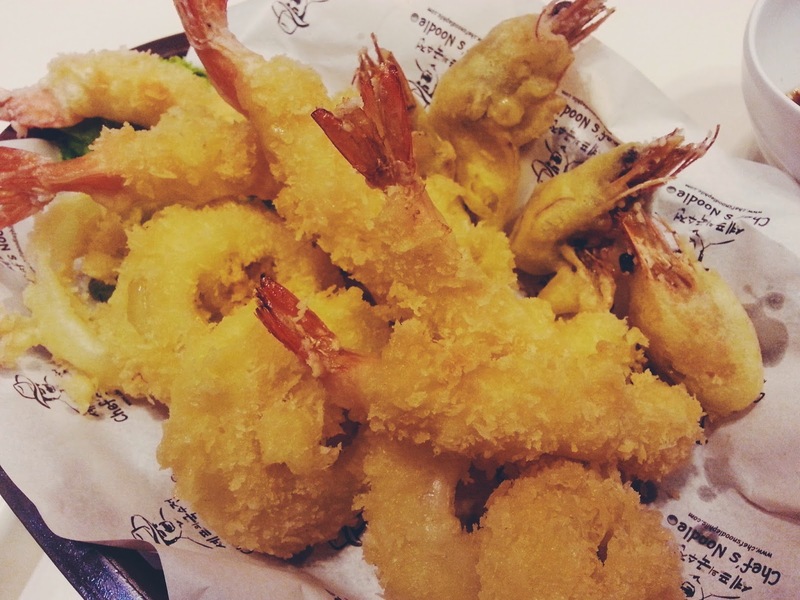 It's like the Korean version of tempura. I never liked sushi (though sashimi is a different story) and when I ate a piece of this, I was still confused on what I should expect it to taste like. 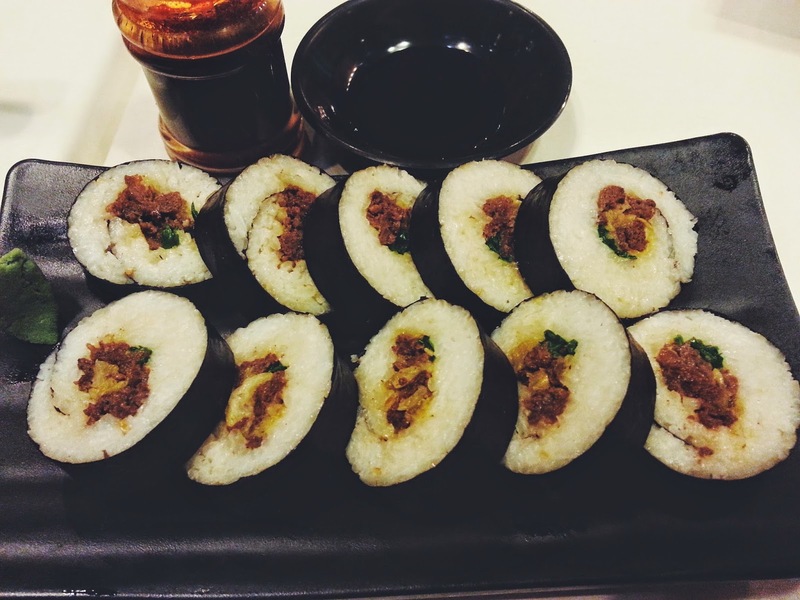 Those are 10 pieces of nori-wrapped Korean sticky rice that's rolled with beef bulgogi and vegetables. I thought it was a bit on the bland side but a piece sure is heavy. I think you should dip it first in soy sauce or add a little wasabi to give it a kick. We were all kind of laughing when this was served at our table because, to be honest, this doesn't look very appetizing. But I thought it tasted good. The taste of the curry was strong but still tolerable. Had to stop eating it after some time though because at some point, it was too salty for me. I had high expectations with this because if you name the dish after your restaurant (or was it vice versa? ), it must really, really good, right? Four stars to Chef's Noodle for hitting the mark with their signature noodle soup! This is comprised of Korean noodles topped with leeks, bean sprouts, fried tofu, spring onions, egg roll, and beef bulgogi in a beef broth base. It was hearty and delicious, and the serving was hefty. I loved the kick of spiciness, too! This is Chef Choi In Sun's signature dish, named after the TV show he was famous for in Korea. Those are thinly sliced Australian beef topped over sticky rice. A food attendant will cook the beef for you (sorry, you can't cook it yourself) using a blowtorch and you can opt to have it rare, medium rare or well done, whichever you prefer. 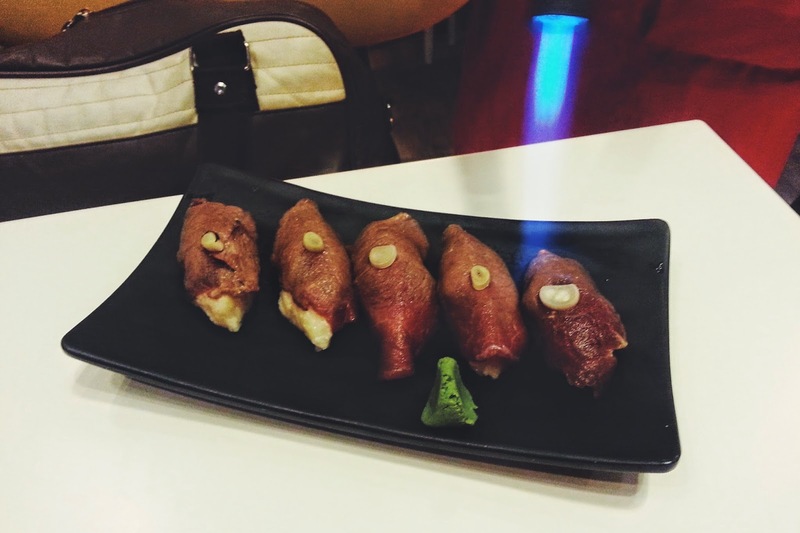 Though the blowtorch-ing of the sushi is already half the joy of the dish, it still worked for me. I liked the taste of the beef on the sticky rice (though the beef was a tad too chewy for me), and even better when you dip it in the special sauce. There's two more variants of this: Shrimp and Tuna sushi. This is my favorite out of everything we've tried. Well, I'm a bit biased because I like egg anyway it's cooked. 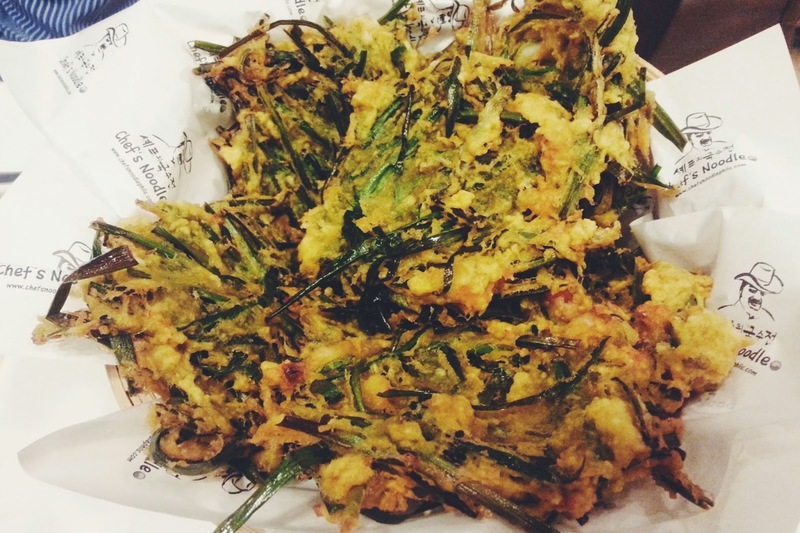 Everytime I visit a Korean restaurant, I always, always order this. 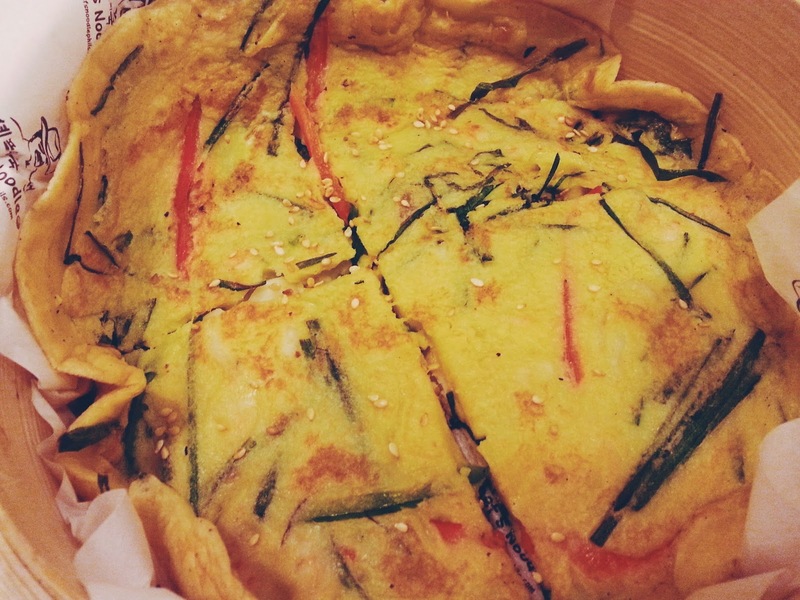 I judge them with how they make their pajeon. Because I've always thought, it's an egg-based dish, if you can't make this right, how would you even perfect the complicated dishes? Putting all my rants aside, I really enjoyed eating Chef's Noodle's pajun. It's light but filling, and very flavorful! The sprinkle of sesame seeds on top was a first for me. It actually added a little texture, a little crunch when taking a bite of this dish. The only thing Korean about this dessert was the name (it was a popular Korean drama) but everything else was downright plain. 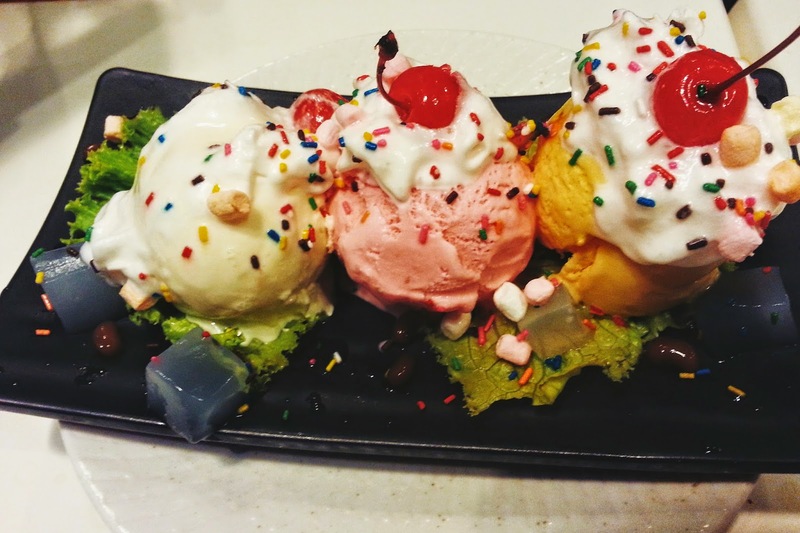 It's regular store-bought ice cream with pieces of nata de coco, beans and marshmallows. And what's up with the greens? *puzzled face* I would suggest they put a Chef's Noodle touch on their desserts. Something not too safe or traditional. There were definitely some hits and misses on Chef's Noodle's menu but they're still relatively new so I know there would still be improvements. 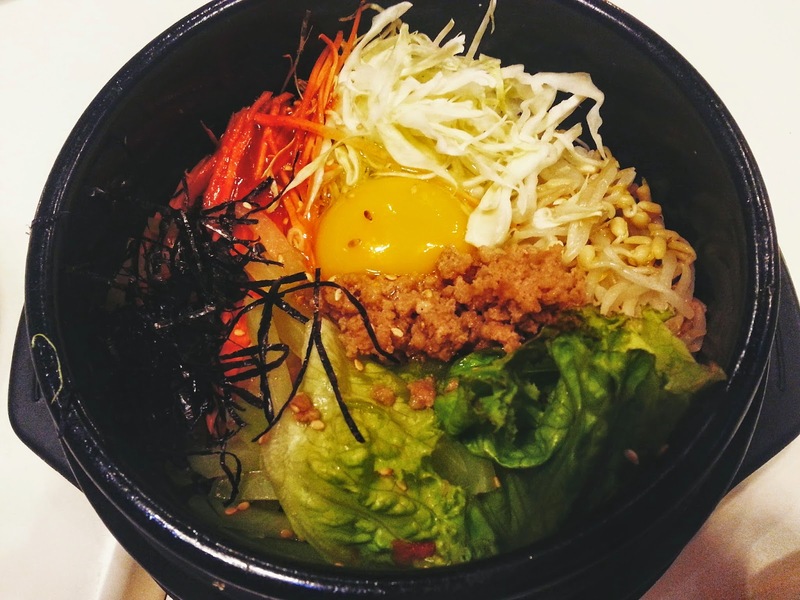 The modern twists to some of my Korean food favorites might take a while to grow on me but budget-wise (and since most dishes are healthier options than most fastfood of the same price range), I wouldn't mind paying them a visit again. There's still too much on the menu left to try! ALSO: SEAFOOD PAJUN! I hope they have more branches soon, too!